We are delighted to present the Introduction to Sanskrit, with Jo Brill Sept 12, 13 through our Yoga Sukhavati: Art of Sound Module. Jo is a gifted and generous teacher and we are very excited to share her with you! We talked to Jo about her love of Sanskrit, how it enhances the teaching of yoga, and the many wonderful people she has met on her journey. Where are you from originally? How long have you lived in NYC? I was born upstate, in Troy, but grew up “in the middle” — Arkansas, Kansas, Missouri, Iowa. I’ve lived in New York State since 1980 when I started grad school, the first time, and I’ve lived in Peekskill (commuting distance!) since 1987. I started taking yoga after my first baby. Lucked into a wonderful teacher, Mia Azcue, the very first class and I have been her student since then! How long have you practiced yoga? How long have you been teaching yoga? I started practicing in 1988 or so — but casually. I got much more interested after a mid-life crisis in my 40s (I schedule one each decade!) and that’s when I sought out training, with Fran Ubertini, and began to teach — in 2004. Fran gave us several assignments to reflect on various yoga sutras, and I got frustrated with the variances in translation and interpretation! That’s what led me to Sanskrit. I met Leigh when she signed up for a one-week intro intensive. That class was full of bright and loving people!! Of course Leigh was a ringleader! Who is your sanskrit teacher? I’ve studied with many wonderful teachers. My first teacher, Vyaas Houston, gave me invaluable tools for learning and focus — and his love of the Sanskrit theory of grammar proved contagious! I have had amazing opportunities to study with marvelous teachers at the University of Chicago, Oxford, Columbia, and Penn — some of the finest Sanskritists in the world. I must also mention Prof. Ramkaran Sharma, with whom I studied seven summers; his sweetness and brilliance as a teacher and a person is unparalleled. What got you interested in Sanskrit? At what point did you decide you wanted to teach it yourself? It was not the sound, though that attracts so many people. It was the philosophy. I wanted clarification! And I wanted it straight from the source, not distorted by commentary. Yes, I was a little naive! Vyaas had us start teaching early. When I started in 2007, I’d been studying for just 18 months, and really didn’t know much! — but I was able to teach the alphabet using his wonderful method. What is the most rewarding part of learning sanskrit? Sanskrit continues to teach me about the incredibly complicated texture of human learning and culture. For a while I loved the neatness — you know, like math. Turns out, as with math, when you go far enough, things get less neat! I’m just grateful that somehow I found this language, so elegant and powerful, as well as the astoundingly huge multitude of texts it opens up for the reader. As a yoga instructor, how does learning sanskrit beyond the names of asanas enhance ones teaching? More and more, I feel that it’s important for westerners, many of us from variously privileged backgrounds, to remember that we are choosing to spend our time with cultural phenomena that are not ours by heritage. For our students’ sake too, it’s important not to be a jerk. Even inadvertently! While we may love the “exotic” for its power to show us truths about ourselves (more clearly perhaps than our own cultural practices do) — we should keep in mind that symbols, and certainly utterances, have religious and political implications we are almost certainly not fully aware of. It’s important to keep firmly in mind that we don’t know everything — on the contrary! Sanskrit has been for me a never-ending onion. Its layers and layers of meaning and significance are truly humbling. What are you looking forward to most about being a part of Yoga Sukhavati’s Art of Sound module? I absolutely love teaching this workshop. For one thing, I have met so many lovely people through Sanskrit. So when I walk in and see your faces, and hear your voices, I know that there are warm and precious connections to be made. For another — well, any time you spend hours with these sounds, you will have fun and you will go deep! Last, I know I will learn something. It’s through Sanskrit that I finally learned how grateful teachers are for students. I will love meeting each person! You just returned from India. Any take-aways from this most recent trip that you would like to share? It was only my second trip. I’m still processing, but again, I must emphasize the people. Brilliant and caring teachers, a warm and wonderful host family, and awesome fellow students who broadened my mind with their wide range of interests. Such generosity! What is your favorite activity to do in NYC? Hmmm, that’s difficult! Theater, maybe? But I also love to eat! Recently my two sons that live in Brooklyn have been showing me some great new restaurants. My third son has also treated me, but you didn’t ask about Boston! Please add anything else you would like to share! Until we meet, भद्रं ते ! The Yoga Sukhavati: Art of Sound module begins the weekend of June 12 with the very talented Shyama Chapin. 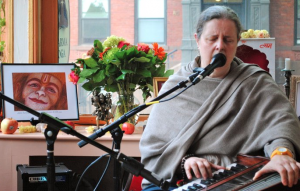 Learn more about Shyama and the meditative effects of kirtan. Where are you originally from? How long have you lived in NYC? I was born in Elsah, Illinois, where my dad was a college professor. But I mostly grew up in New York City, through high school. Then I went as far away as I could, to New England and then Northern California. I’ve been back living here since 2009. I’m still not quite sure how that happened! What is kirtan? What does kirtan mean to you? Kirtan is a practice that is part of the tradition of Bhakti Yoga from India. It is simply call and response chanting, singing in a group with someone leading and everyone else responding. Namakirtan specifically is the practice of chanting what are called the Divine Names, which are Sanskrit words that have been revealed to a being in a high state of realization. They are considered to be various ways of naming that essential reality which is the ground nature of everything that is, including us of course! One of many paradoxes is that this reality exists beyond name and form, but yet when we call out to it, that invocation gently intensifies our awareness of this reality which is our own true nature—which is Love. You could say that all of these names are simply names of Love. The practice of chanting the Names is also a method of beginning to release our obsession with the stories we tell ourselves about ourselves and the world that cause us so much pain. For me personally, it has been a huge grace and blessing to be given this amazing boat to rest in in the middle of the wild and confusing ocean of my mind and my life! How long have you been practicing kirtan? How did you get interested in it? I always know when I first became aware of this practice, because it was right after 9/11. I didn’t so much get interested in it, which would be sort of a intellectual thing, as find myself completely drawn to it without giving any thought to why. There’s a story about how that came about that is too long for here…maybe I’ll tell it as part of the workshop! In addition to kirtan, you also play the harmonium. Have you always been a musician? Actually, I play harmonium when I’m chanting, and not really outside of that. So it’s part of kirtan for me. When I started leading kirtan, I was chanting with a folk instrument from India called an ektara, which is a gourd with a skin head and a long neck attached, and one or two strings that are played in a rhythmic drone. I started with that, I guess, because I’ve been a guitar player since I was a kid, and strings seemed natural to me. My dad was a choir director and a pianist and organist, and I took piano lessons from him from age 3 to 7, when I quit! He actually gave me a guitar then, and told me he didn’t know how to play it…I basically hid in my room singing and playing it pretty incessantly for a bunch of years after that, and started writing my own songs. Later I started performing my songs solo with the guitar in New England and California mostly, and recorded a solo CD. And I was in a jam band in the Bay Area with a bunch of friends that did some recording as well. What would you tell someone who is interested in kirtan, but may not be musically inclined? The thing is, the practice of kirtan looks like it has to do with music, because there’s music along with it, but it’s actually not fundamentally about the music. It’s about repeating the Names, which is where the juice is. So practicing kirtan as part of the response group doesn’t require any musical ability at all, and in fact if you are inclined to be distracted by how nice your voice is, or how musical you are those things can be distractions to the practice for sure. Of course, if you are inclined to be distracted by how much you dislike your voice, or whatever, that can be distracting too! If you want to lead kirtan, there is a little bit of musical ability that is called for, just to hold the thing together. But not really that much. You can keep the chant really basic musically and have a fantastic kirtan. How do yoga asana and kirtan compliment each other? Both asana practice and kirtan practice require concentration and awareness, and ultimately the reality that is being approached is the same, since it’s the only reality there is! But the vehicles are quite different: the physical body/energy body in asana practice and the heart/mind in kirtan practice. So there is a nice balance energetically when you bring them together I think. The practice in the body supports the mind/heart practice in a really lovely and helpful way, and vice versa. Has there been one particular kirtan experience that stands out to you? If so, please share. Chanting directly in front of my guru in India, when I have done that, has been a huge blessing and teaching. It’s another long story (or two!) But many many kirtans have been high points for me…actually any opportunity to chant with others in this way is a high point…I totally mean that. 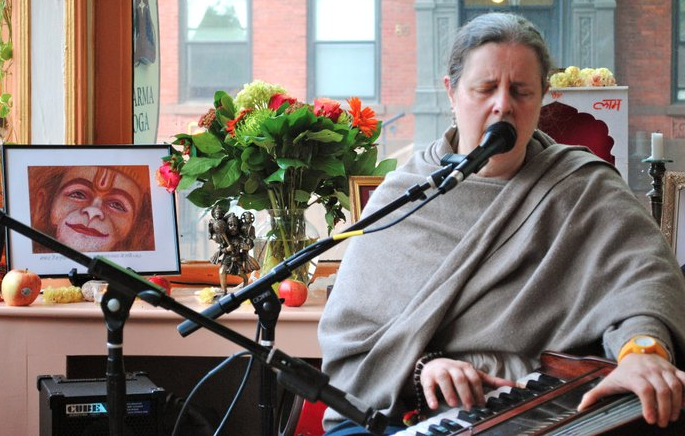 One of my favorite memories is of a kirtan a while ago in Massachusetts at a little yoga studio: my drummer had to bail at the last minute, and only one person came to sing. So it was just the two of us and the harmonium and she had never chanted before! But she wasn’t afraid to sing, and she caught on to the idea of singing back and forth with concentration right away. We sang for a couple of hours and it was amazing! Really beautiful. What are you most looking forward to about the workshop with Yoga Sukhavati? Chanting the Names together, of course…it’s the best thing there is! And also exploring the practice together in a way that hopefully empowers everyone who comes to feel confident about bringing it into their personal practices and their yoga asana classes as well. I hope everyone will bring both open minds and a willingness to ask lots of questions. What can you be found doing when you are not leading kirtans? I am a New York State licensed massage therapist, seeing clients at Greenhouse Holistic on Bedford and North 7th in Williamsburg from Thursday through Saturday, as well as through Zeel Massage on Demand and privately. I also travel to students’ homes in the NYC metropolitan area to teach private harmonium lessons for chant practice, and I work as a personal assistant one day a week. Whenever I can, I love to chant with my friends’ when they are leading kirtans—I’m very lucky to have a lot of friends who are great kirtan walas, including Krishna Das…practice with all of them and especially with him is a huge grace for me. When I get a chance, I like to spend time outdoors in the country…woods, mountains, ocean…it’s all good and makes me happy as clams. And occasionally I sleep. Come practice and learn kirtan with Shyama (and Leigh Evans) at The Art of Sound workshop, June 12-14 at Loom Yoga Center in Bushwick. Saturday, June 13 and Sunday, June 14: 9a.m.-12:30p.m. and 2-6p.m. 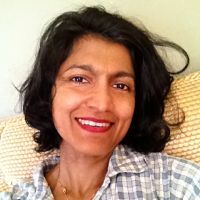 To learn more about Shyama, visit her website, shyamachapin.com.